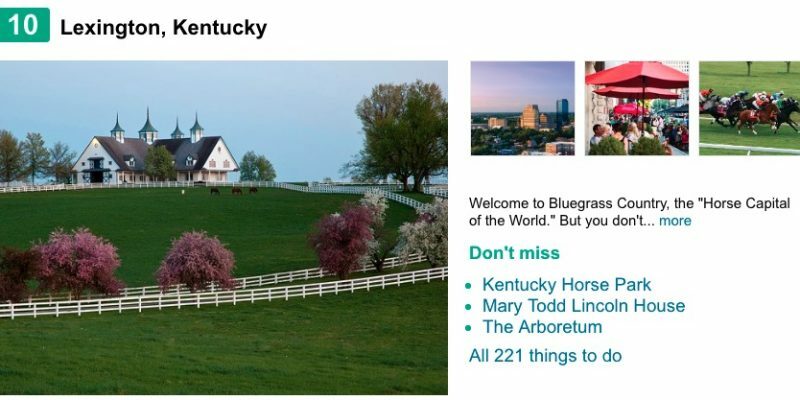 There is only one Kentucky town that made it onto TripAdvisor’s “top destinations on the rise–United States” list this year, and it’s Lexington, placing in at #10. TripAdvisor measures year-over-year increases of positive traveler review ratings to determine which locations are “on the rise.” Lexington made the list based on review ratings of accommodations, restaurants and attractions that met every traveler’s budget. More and more people are searching to book reservations because of what Lexington offers in these areas. The Kentucky Horse Park is a working horse farm and an educational theme park that also has two museums: the world-renowned International Museum of the Horse, a Smithsonian Institution affiliate, and the American Saddlebred Museum – the Showplace for Saddlebreds. Mary Todd Lincoln House, located in downtown Lexington, was the family home of the wife of the 16th president of the United States, Abraham Lincoln. The Lexington Cemetery is also a popular destination, with its arboretum, lakes and a Romanesque gatehouse. Lexington is home to eight colleges and universities, including the University of Kentucky.